The Public Building Commission of Chicago (PBC) recently received top honors for three different projects. The Chicago Children’s Advocacy Center, the Chinatown Branch Library and Albany Park Branch Library all received recognition for their impact on the communities in which they sit. 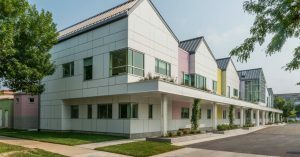 The PBC-developed Chicago Children’s Advocacy Center Addition project, located on the near west side, received the 2016 Chicago Building Congress (CBC)/Construction Owners Association of America (COAA) Owner’s Choice Award at the CBC’s 60th Annual Merit Awards Night on May 25. The Chicago Children’s Advocacy Center Addition nearly doubled the size of the existing nonprofit facility. This facility allows cross-governmental collaboration in the investigation of allegations of child abuse, while also providing the necessary social services to victims and their families. The CBC/COAA Owner’s Choice Award recognizes the team’s success in balancing a comforting, warm design with the need for expansion of this multi-agency social service center. 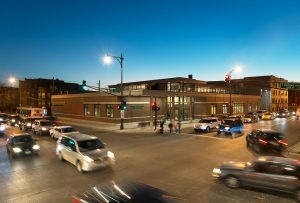 Turning to the Library Program, the Chinatown Branch Library, Chicago Public Library’s newest location, was awarded the 2016 CBC Merit Award for new construction projects under $55 million as well as the prestigious 2016 Vision Award for Public Investment from the Urban Land Institute (ULI) Chicago. ULI recognition designated the project for a high standard of excellence in several areas — design, construction, economics, marketing, and management. The Chinatown Branch Library, developed by the Public Building Commission on behalf of the Chicago Public Library, features a Feng Shui inspired design nestled in the heart of Chicago’s Chinatown community. 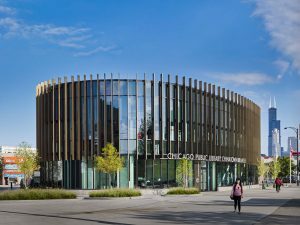 Representing magnificent design while championing environmental sustainability, this library has also been recognized by the American Institute of Architects (AIA) and the American Library Association. “The PBC is committed to developing municipal buildings that reflect the highest standards of environmental and economic sustainability, said Executive Director Davis. “Together, with our clients at the Chicago Public Library and the Chicago Children’s Advocacy Center, along with our design and construction partners we were able to develop buildings that not only enrich the physical landscape of our city, but enhance the social landscape of our communities,” Davis continued. “Having multiple projects recognized in the same year highlights the great work made possible through close collaboration with our many partners. The Albany Park Branch Library received the 2016 Good Neighbor Award from the Chicago Association of Realtors. In collaboration with the Chicago Public Library, the PBC developed this community anchor for the Albany Park neighborhood. Albany Park is a branch library featuring a 780-square-foot YOUmedia digital learning lab for teens where they can record music, hone their graphic design skills, and enhance their photography talents. The library also serves as a model for other branches with its interactive early learning space for children, specifically designed to enhance the formative learning years of children up to age five. The design for the children’s area is guided by the five ways children learn: “read, write, sing, talk, play!” The library also features a reading garden that provides green space in a highly-populated, urban neighborhood. “This special recognition underscores the overarching goal of our agency: to develop public buildings that serve as community anchors which, ultimately, catalyze positive community building,” said Felicia S. Davis, Executive Director of the Public Building Commission. “This new library contributes to the vibrancy of the neighborhood and brings state of the art amenities to the community,” she continued. Executive Director Davis extends thanks to the design and construction teams whose work helped to deliver the award-winning projects. The Chicago Children’s Advocacy Center Addition was designed by Holabird & Root and built by IHC Construction. The Chinatown Branch Library was a design/build project led by Wight & Company with Skidmore Owings & Merrill (SOM) serving as the design lead. The Albany Park Library was designed by Jackson Harlan, LLC, and constructed by general contractor, Wight Construction. About Chicago Children’s Advocacy Center: Founded by Mayor Daley in 1998, Chicago Children’s Advocacy Center and its partners are the city’s front-line responders to reports of child sexual abuse, as well as reports of physical abuse of children under age 3. Learn more by visiting ChicagoCAC.org. About Chicago Public Library: Since 1873, Chicago Public Library (CPL) has encouraged lifelong learning by welcoming all people and offering equal access to information, entertainment and knowledge through innovative services and programs, as well as cutting-edge technology. Through its 80 locations, the Library provides free access to a rich collection of materials, both physical and digital, and presents the highest quality author discussions, exhibits and programs for children, teens and adults. CPL received the Social Innovator Award from Chicago Innovation Awards; won a National Medal for Library Services from the Institute for Museum and Library Services; was named the first ever winner of the National Summer Learning Association’s Founder’s Award in recognition of its Summer Learning Challenge; and was ranked number one in the U.S., and third in the world by an international study of major urban libraries conducted by the Heinrich Heine University Dusseldorf in Germany. For more information, please call (312) 747-4050 or visit chipublib.org. About the Public Building Commission: The Public Building Commission of Chicago manages construction and renovation projects for the City of Chicago and its sister agencies. Mayor Rahm Emanuel serves as the PBC’s chairman. Felicia S. Davis serves as the Executive Director of the PBC. Additional information about the PBC and its projects can be found at www.pbcchicago.com. You can also follow the Public Building Commission of Chicago on Twitter, Facebook, LinkedIn, Pinterest and Flickr.